Designed to mount above a doorway frame on a standard wood stud wall*, the Rogue Jammer Pull-Up Bar is an everyday game-changer—enabling athletes to transport their fitness lifestyle, without compromise, into any room of their home or workplace. The system, which includes a 43” long stringer, 0.375" thick laser-cut steel brackets, and a custom-finished 1.125" diameter bar, is on par with the equipment you’re already using at the local gym or in the garage. Only now, you can integrate part of that experience into your "between workout" hours—do a few pull-ups anytime you walk through that door; challenge family members or co-workers to do the same. Set the bar and stick to it. 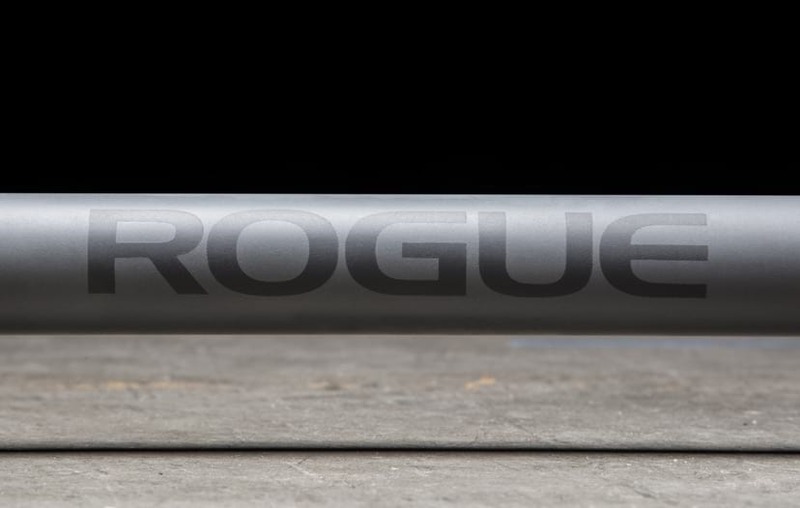 The pull-up bar itself is available in your choice of a knurled or smooth finish, and can be further custom selected in Rogue textured black powder coat, stainless steel, or any one of ten exclusive Cerakote color finishes—with Rogue logo branding in the center of the bar. The stringer and brackets are available in two powder coat finishes, as well (Medium Gloss Black or Textured Black), so it’s easy to customize the whole system to match your preferences and/or the existing color scheme of a room. *Each order comes standard with a set of (6) 0.375" x 2.5" wood lags for mounting the stringer. If you plan to mount to something other than wood studs, we recommend contacting a general contractor to assist in planning an alternative install process. Designed to mount above a doorway frame on a standard wood stud wall*, the Rogue Jammer Pull-Up Bar is an everyday game-changer—enabling athletes to transport their fitness lifestyle, without compromise, into any room of their home or workplace. The system, which includes a 43" (Stringer) long stringer, 0.375" thick laser-cut steel brackets, and a custom-finished 1.125" diameter bar, is on par with the equipment you’re already using at the local gym or in the garage. Only now, you can integrate part of that experience into your "between workout" hours—do a few pull-ups anytime you walk through that door; challenge family members or co-workers to do the same. Set the bar and stick to it. The standard 1.125" diameter pull-up bar included with this system is uniquely customizable to match both your preferred look and feel. All bars are available in a smooth or knurled texture, and can be selected in standard textured black, stainless steel, or any of these Cerakote color coatings below (Cerakote is a versatile ceramic-composite coating originally popularized in the firearm industry for its remarkable durability even in thin applications). 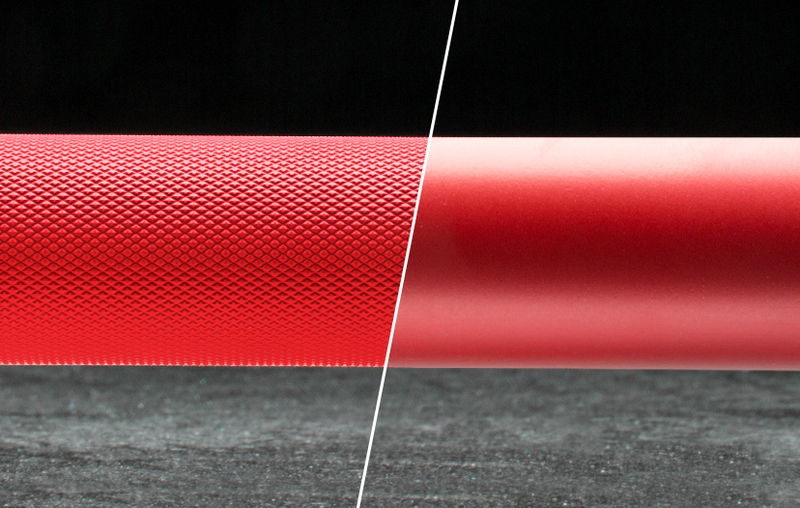 All finishes can be ordered in your choice of a Smooth (no knurl) or Knurled version. The knurled bar features a smooth center portion that’s 17.4" wide, with dual knurl marks on each end that match the spacing on standard Olympic and Powerlifting barbells. The knurl pattern is firm enough for a reliable added grip, but non-abrasive. If you’re accustomed to training with a certain caliber of equipment in the gym, you shouldn’t have to lower your standards for an in-home pull-up system. 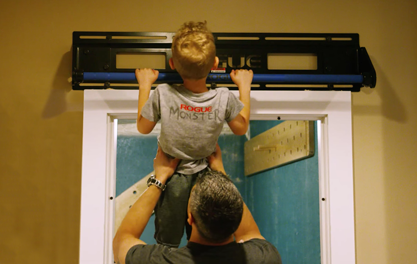 The Rogue Jammer Pull-Up Bar mounts above any door frame on a wood stud wall, and allows athletes to integrate their lifestyle of fitness into their daily home or work life in a new way. It's a simple, classic implement—built to a higher standard, and customizable to any room. 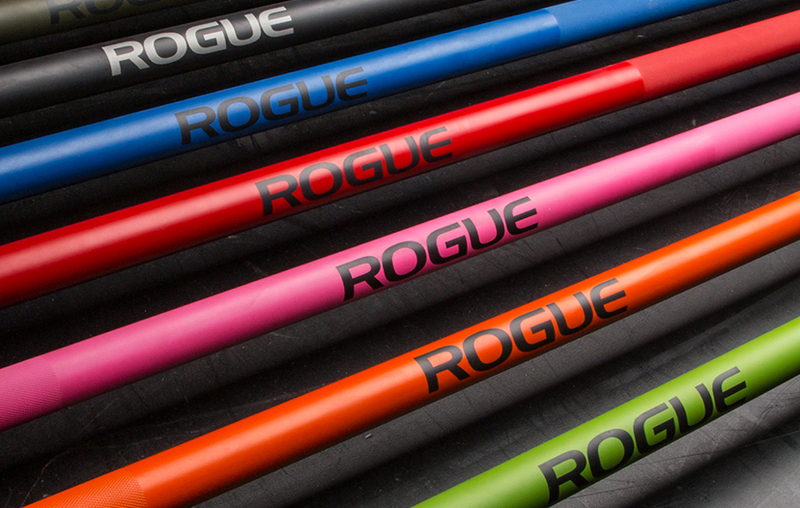 The Jammer Pull-Up Bar is part of growing arsenal of Rogue weight training equipment featuring new color finish options. You can customize your entire gym with a Cerakote Ohio Bar, Cerakote Bella Bar, or a Monster Lite Power Rack in a range of semi-gloss color finishes. 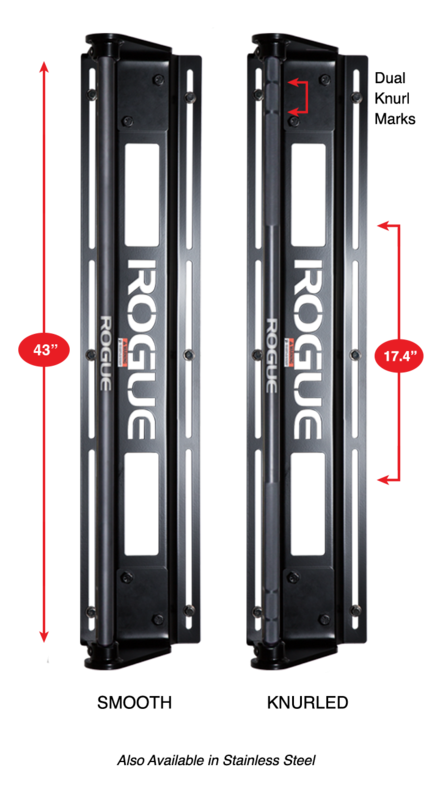 Rogue Jammer Pull-up Bar is rated 4.9 out of 5 by 107. Rated 5 out of 5 by DBreuer15 from Best Pull-up Bar I’ve been looking for pull-up bars for a while. Went through a handful with the door jammer and a few others that when your pulling yourself up it seems it’s just about to crumble. Found this tank and it does the job and then some. It said recommended to put on three studs but only had the two studs and the center I just used butterfly screws since the sides were solid enough. Was able do assemble myself but I will admit may be better having a partner when your trying to get at least two bolts in. Just an amazing product. Rated 4 out of 5 by TM93 from Bullet Proof! The moment I saw it, I ordered it. I was a bit surprised how heavy it was in general and have concerns if that provides unnecessary load for my door framing. The construction is amazing and it was properly packaged and shipped. I am always impressed by the entire on-line shopping, ordering, and delivery service with Rogue. It took me about 20-mins to install by myself, due to the weight I recommend a helper. Performance wise, I now have a bullet proof pull up bar in my bedroom and this system is core to my daily routine. Very happy customer! Rated 5 out of 5 by Trikerdad from Solid and well built I broke one of my heels, leaving me house bound on crutches, and couldn't get to the gym for awhile. I have free weights at home but no way to do pull ups. I found the Rogue Jammer on line and it looked like what I was looking for. It's kind of heavy and was a little difficult to mount while on crutches but, I managed to put it up on the inside of my stairwell doorway. It's pretty much out of sight but, still very handy. Now any time I'm near it, I do as many pull ups as I can. I weigh 220 and have full confidence in the Jammer. Rated 5 out of 5 by Blueboyal from Jammer is Great for TRX and Pull-ups! I installed this diesel beast a few weeks ago and I'm still sore from hoisting it overhead to install it. It's heavy and freakin' well-built. I recommend this to anyone who has the ability to overhead press 100 lbs while using a socket wrench to install monstrous lag bolts into stud framing. It's that easy! All joking aside, this thing is great. Pull-ups, TRX, T2Bs, etc... The Jammie-Jammer is perfect for home use. I weigh close to 200 lbs and I can swing like a chimp from it without issue. Rated 5 out of 5 by SquatsDave from Absolute Monster Pull Up Bar If you have any doubts let me go ahead and kill them for you. 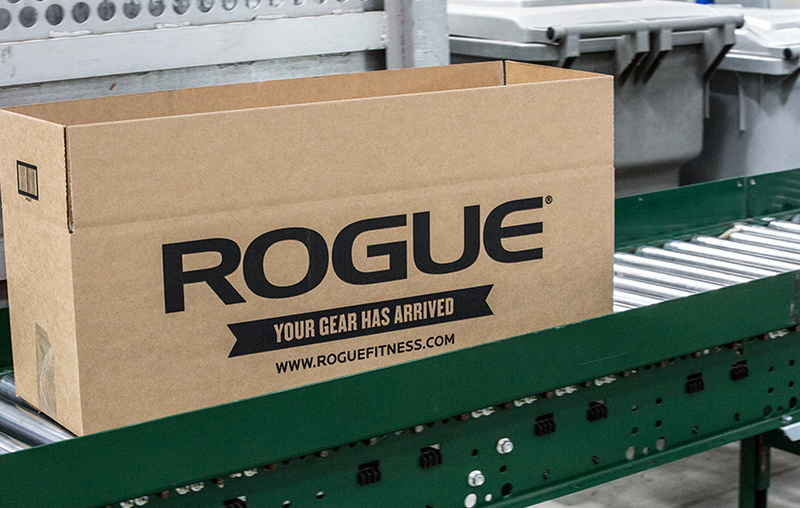 As is typical with rogue products it shipped quickly and in excellent shape. Very heavy duty packaging. I had it less than a week after I submitted my order. Installation was a bit of a pain, but this was mostly my own fault. I'm 6'2 and chose to hang it high enough that I could hang with my legs fully extended. I also chose to hang it in a room that is barely wider than the bar itself. The bar is HEAVY. Which is a great thing, but combined with a high hanging point and a small work space can make it a tough project pretty quickly. Make sure you have a power drill, a socket wrench, and a buddy to help hold it up while you get the first couple bolts in the wall. As far as actual function it's a beast. I weigh 275 and can kip my pullups without so much as a wiggle. Honestly it feels more secure than doing pullups on a squat rack. 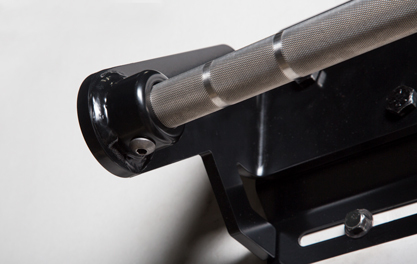 The knurling is aggressive enough to make a difference but not enough to trash your hands. Rated 5 out of 5 by Terminator from DEFINITELY WORTH IT! I've had the Rogue Jammer for probably a month now or so, it is definitely worth the money. I weigh close to 240lbs., and this morning was doing multiple sets and reps with 75lbs. hanging off of my dip belt. I was a bit leary at first with concerns that I would tear it out of the wall, but now I have no doubt that it will hold no problem. I have been EXTREMELY pleased with this product. Rated 5 out of 5 by RJSmith from Solid Pull-Up Bar I purchased the Jammer Bar a few weeks ago and finally got around to installing it. The installation was painless and can be done by yourself if needed. Although my ceilings are pretty low, I still have plenty clearance at the top of the pull-up. Overall, this pull-up bar is solid. I am around 200 lbs and the bar doesn’t budge. Rated 5 out of 5 by Cassie from Sturdy! I love my new pull up bar! Super sturdy and hold weight well! Absolutely love it!